On this date in 1822, Johan Wilhelm Gebhardt was executed at the Dutch-founded South African settlement of Paarl. His offense, unusual but not unheard-of in our executioner’s annals: killing his slave. the flogging was done repeatedly by a slave called November who had been warned by Gebhardt, who remained present throughout the torture, that he too would be severely punished if he did not flog Joris properly. The flogging was done with a variety of instruments and from time to time salt and vinegar were rubbed into his wounds. It was only when Joris lost consciousness that the torture stopped. The western Cape had recently been taken under British management, and these looked with surprising hostility on the murder of Joris. Gebhardt was not suffered to plead to manslaughter in order to escape his fate. There’s no gravestone for Joris, of course. On this date in 1835, four African slave rebels were shot at Salvador. The Malê Revolt acquired its name from the local designation for Muslims … which was the predominant religion of the slaves harvested from West Africa* who were pouring into Brazil. (It’s also known as the Muslim Revolt, or simply the Great Revolt.) Ethnically, these were mostly Yoruba peoples, known in Brazil as Nagôs; Nagôs constituted the bulk of the slave sector whom the Portuguese had nicknamed “Minas” — Gold Coast imports who had embarked their slave ships at the notorious Elmina Castle. The slaves of Bahia are more difficult to manage than those of any other part of Brazil, and more frequent attempts at revolt have taken place there than elsewhere. The cause of this is obvious. Nearly the whole of the slave population of that place is from the Gold coast. Both the men and the women are not only taller and more handsomely formed than those from Mozambique, Benguela, and the other parts of Africa, but have a much greater share of mental energy, arising, perhaps, from their near relationship to the Moor and the Arab. Among them there are many who both read and write Arabic. They are more united among themselves than the other nations, and hence are less liable to have their secrets divulged when they aim at a revolt. On the night of January 24-25 of 1835, some 300 of these African-born slaves (with a few African-born freedmen) rebelled and attacked the city of Salvador. The fighting spanned only a few midnight hours; rumors of a rising had reached white ears on the 24th and as a result the masters stood halfway prepared and rallied quickly enough to crush the revolt — killing around 80 rebels in the process. Nevertheless, it was perhaps the largest and most frightening servile rebellion in Brazil’s history. 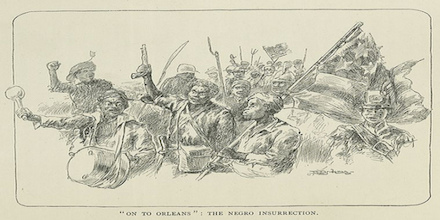 And although not all participants were Muslim, they very distinctively were all African-born: second-generation, Brazil-born blacks (whether slave or free) as well as mulattoes, who occupied a higher caste rank more in simpatico with whites, were deeply distrusted by African natives as liable to betray the plot — and rightly so. This turned out to be the very channel by which advance warning of the imminent rebellion reached white ears on the night of January 24. It was a great, if last-minute, victory for white Brazilians’ intentional stratification of the servile labor force: “The division among Africans is the strongest guarantee of peace in Brazil’s large cities,” the governor of Bahia had written in 1814. It seems fitting, as has been suggested to me by many Citizens of this Capital, that the Government of His Majesty the Emperor, so as not to diminish the healthy effect of an execution as soon as possible after the crime, should have the sentences carried out on the two or three main leaders, at the same time declaring that these individuals should not have any recourse or appeal; that is, such a measure is thought to be both efficacious and necessary to the present circumstances. In a decree dated 18 March 1835 the central government accepted this suggestion and ordered that the death sentences be “immediately carried out without being allowed to go before a Court of Appeal, after the remaining legal steps had been taken.” A month later, on 14 May, one day after the publication of the law on deportations, and without having taken “the remaining legal steps,” the government put four Africans to death. There was only one freedman among those executed: Jorge da Cruz Barbosa, a hod carrier (carregador de cal) whose African name was Ajahi. Ajahi had been arrested on the day after the uprising, in the house of some fellow Nagô acquaintances, Faustina and Tito. Tito was also involved in the rebellion and had left home some days before the twenty-fifth, never to return. On the morning of the twenty-fifth, Ajahi showed up wounded and hid under a bedframe (estrado). Faustina turned him in to inspectors Leonardo Joaquim dos Reis Velloso and Manoel Eustaquio de Figueiredo, who arrested him. Under questioning Ajahi declared that he lived on Rua de Oracao and was a neighbor of Belchior and Gaspar da Cunha, whom he used to visit regularly. Concerning the meetings they had there, he claimed: “Everybody prattled on and on or just stopped in to say hello.” He denied being a Malê and having participated in the revolt. He tried to convince the judge and jury that the bayonet wound in his right leg “had been inflicted by soldiers … while he was at the window, [and] not because he was outside fighting with anybody.” Ajahi was apparently just an ordinary rebel. Indeed none of the Africans questioned in 1835 suggested he had played an important part in the Malê organization. Even so, on 2 March 1835 he was sentenced to death, along with other important prisoners. His sentence had been set by Francisco Goncalves Martins, the chief of police, now presiding over the jury as a judge: “In light of the previous declaration … on behalf of the Sentencing Jury I sentence prisoners: Belchior da Silva Cunha, Gaspar da Silva Cunha, and Jorge da Cruz Barbosa (all freedmen), as well as Luis Sanim, a slave of Pedro Ricardo da Silva, to natural death on the gallows.” With the exception of Jorge Barbosa (Ajahi), all those listed by Martins had their sentences commuted. Ajahi appears to have escaped from prison, but he was quickly recaptured. Perhaps the maintenance of his sentence comes from his being considered an incorrigible rebel. Little is known about the others sentences to death. They were all Nago slaves. One of them was Pedro, a slave of Joseph Mellors Russell, the English merchant. It seems that all of this man’s slavees took part either in the rebellion or, at least, in the Malê conspiracy. On his own Russell had turned over to the justice of the peace a crate containing a great number of Malê objects belonging to his slaves — Necio, Joao, Joaozinho “the urchin,” Tome, Miguel, and Pedro. Of all these men Joao was the most militant, and his final sentence is not known. No one knows why Pedro was singled out for the death penalty. I could not find the records for his particular trial. The other two slaves executed were Goncalo, whose owner appears in the records as Lourenco so-and-so, and Joaquim, who belonged to Pedro Luis Mefre. About them all that is known is that they were among the thirteen rebels wounded and taken prisoner during the confrontation at Agua de Meninos. It may be that they were both abandoned by their masters, since nothing suggests that they might have been leaders and none of the other eleven taken prisoner in the same circumstances received similar punishment. Like all public executions, this one had its share of pomp and ceremony. The victims were paraded through the streets of Salvador in handcuffs. At Campo da Polvora new gallows had been constructed to replace the old ones, which had rotted from lack of use. At the head of the cortege marched the council “doorman,” Jose joaquim de Mendonca, who cried the sentence out to the ringing of bells. After him came Joao Pinto Barreto, the execution scribe, and Caetano Vicente de Almeida, a municipal judge. On both sides of the prisoners marched a column of armed Municipal Guardsmen. The Santa Casa da Misericordia was also presente, since the bylaws of that important philanthropic institution obliged its members, who were recruited from the local elite, to march along with people condemned to death as an act of Christian piety. The execution itself was to be witnessed by the interim chief of police (Martins had already gone to Rio de Janeiro as a congressional deputy), Judge Antonio Simoes da Silva, and by the commandant of the Municipal Guard, Manoel Coelho de Almeida Tander. Much to the authorities’ disappointment, the new gallows could not be used to hang the prisoners. No one would act as executioner. On 13 May, one day before the execution, the vice-president of the province, Manoel Antonio Galvao, in response to a request from the chief of police, offered 20-30 milreis to any ordinary prisoner in Bahia’s many jails to act as executioner. Even though that was four months’ earnings for the average urban slave, no one came forward. The chief warden, Antonio Pereira de Almeida, expressed his disappointment in a communique to the chief of police that afternoon: “I have offered the job to the inmates, and no one will take it. I did the same thing today at the Barbalho and Ribeira dos Gales jails, and no one will take it for any amount of money; not even the other blacks will take it — in spite of the measures and promises I have offered in addition to the money.” Either because of prisoners’ solidarity or out of fear of retaliation from the African Muslims, an executioner could not be found. For this reason, still on 13 May, the president of the province had a firing squad formed to carry out the sentences. Then, on the fourteenth at Campo da Polvora, the four men were executed by a squad of policemen and immediately buried in a common grave in a cemetery run by the Santa Casa, next to the gallows. Without the hangings, the didactic value Bahian leaders envisaged in the spectacle was lost. 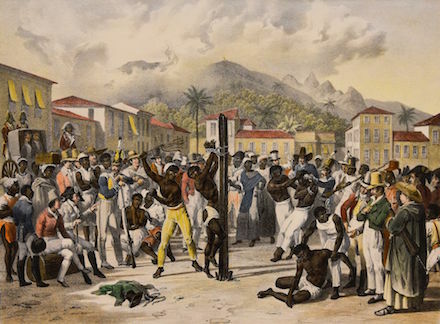 Illustration of a slave being publicly flogged in Brazil, by Johann Moritz Rugendas. On that very day Luiz was admitted to the Santa Casa da Misericordia Hospital, where he stayed for two months. On 3 November he went back to the stocks, and two weeks later he completed his sentence of eight hundred lashes. Narciso, another slave, was less fortunate. He was caught red-handed during the uprising and did not survive the twelve hundred lashes of his sentence. He is the only African known to have died from that terrible punishment, but there may have been more. After the Malê Rebellion, the signs and practices of Islam came under harsher surveillance than ever before. Brazil did not abolish slavery until May 13, 1888 — the very last nation in the western hemisphere to do so. * Prisoners taken by all sides during the wars accompanying the formation and growth of the Sokoto Caliphate were a key source for the early 19th century slave trade. ** Neither teacher was directly involved in the rebellion: one, Ahuna, had alredy been exiled to another locale and the other, Bilal, languished in prison for debts. We have particularly poignant word of the latter’s devastation upon hearing word of what had transpired. After the rebellion, Bilal, still in jail, received news of the fate of the rebellion. One of his cell companions said in a gripping testimony that Bilal lowered his head to weep and that he never saw him raise it again. Bilal wept as many of his cherished students were brought into the jail. When one of the surviving rebels, who was being incarcerated, passed Bilal a piece of paper with a message written on it, he read it and swiftly began to weep. The devastating fate of his students had brought Bilal to a perpetual trail of tears. His fate, however, was to be amongst the most devastating. Although he could not be charged with participation in the physical uprising that took place, it was clear to authorities that he had participated in the spiritual cultivation of the uprising. Bilal “was sentenced to 1,200 lashes of the whip, to be carried out in public, though not in the streets where everyone could see. The sentence was divided up into 50 lashes a day until completed.” We can imagine that this is how Bilal died.